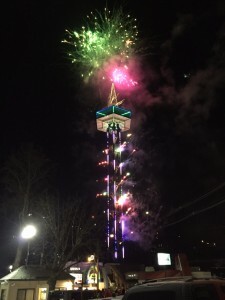 The holiday season in the Gatlinburg and Pigeon Forge area of the Smoky Mountains literally glitters, with millions upon millions of Christmas lights strung everywhere, many of them animated and some of them even synchronized to music. Nature pitches in, as the Smoky Mountains all around continue to provide their colorful sunrises and sunsets, clouds hang in the valleys, mountain peaks show white with snow. Everything looks impossibly scenic, more like a Christmas card than a Christmas card. 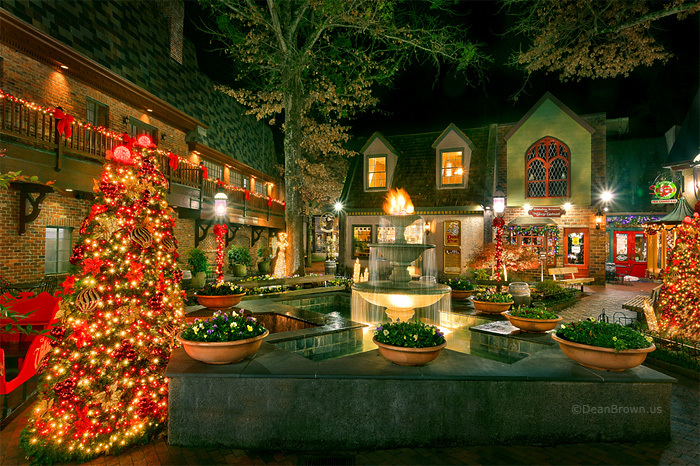 The people meanwhile do their best to add to the charm in all the inventive ways possible, with carolers strolling the streets of Gatlinburg, heated trolleys offering evening tours of the best lights in Gatlinburg and Pigeon Forge, and the whole area a-bustle with happenings and attractions. 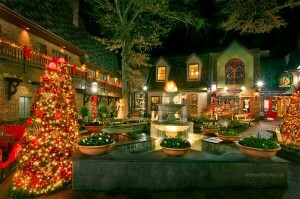 Dollywood offers its own spectacular world of entertainment in its Smoky Mountain Christmas season, with its own daily parade of lights, and its village of synchronized lights. And over in Sevierville, Shadrack’s Christmas Wonderland offers a technically stunning drive-through synchronized light show, where you can stay in your warm car and drive in a maze of roadways amid Christmas scenes set to music. The many restaurants and theaters offer special shows during the Christmas period, from Dixie Stampede’s famous Christmas show to Country Tonite’s “Best Show in the Smokies” and even Elvis is back in town for New Year’s Eve. 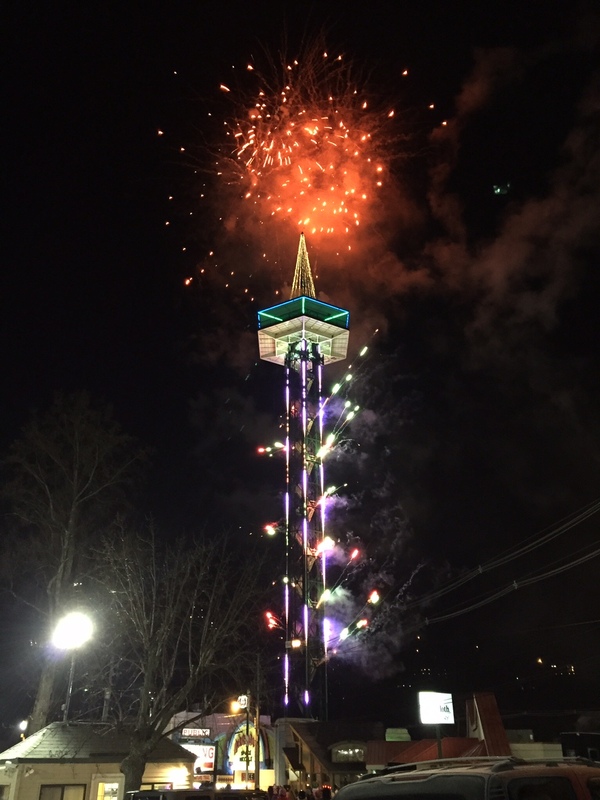 After Christmas comes New Year’s Eve, and as always for the last 27 years, Gatlinburg’s 400-ft Space Needle takes the tallest point in town and launches an amazing, high-tech pyrotechnic show for the Ball Drop and Fireworks Show. Thousands of revelers on the street below gather around hot drinks, cameras light up everywhere – and suddenly it’s 2015. 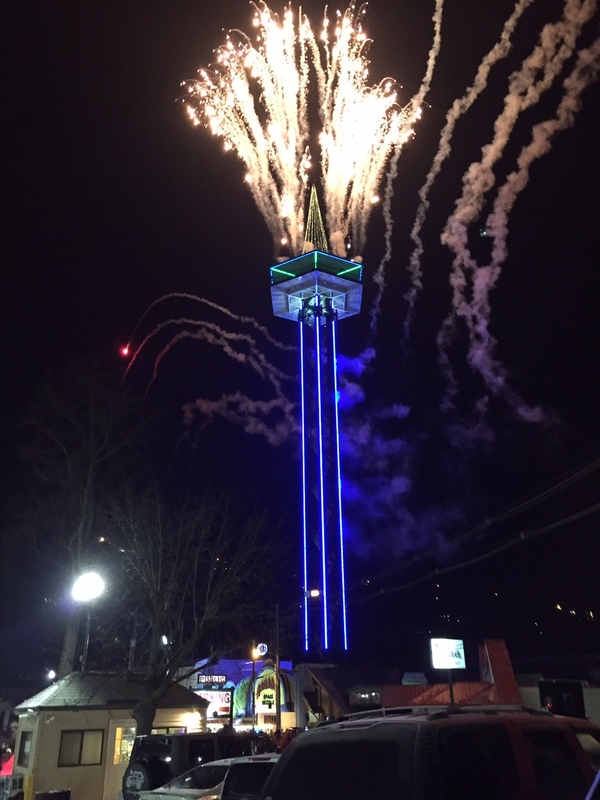 Over in Pigeon Forge, the Island offers its own shopping and entertainment venue to gather and celebrate. 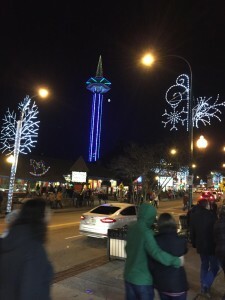 Home to the 200-ft observation wheel, the Island offers no shortage of colored lights, with the lighted fountains and the Wheel itself. Kid-friendly activities, live entertainment, and a countdown to the fireworks at midnight make up the Free, 2nd Annual New Years celebration at the Island. 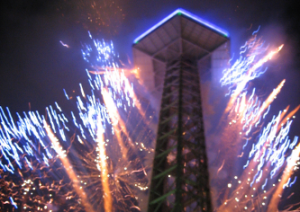 Eventually it’ll be 2015, but the celebration never really ends in the Smoky Mountains. In January the fun continues with more snow and skiing events at Ober Gatlinburg. Winter hiking and sightseeing never stops being fun on mild days. And all the warm snuggling during winter leads pretty quickly to thoughts of Valentine’s Day coming soon. Pretty soon marriage is in the air, in this hugely romantic setting with its legendary weddings. But we’ll get to all that. Stay tuned and meanwhile, Happy Holidays!